Many of the inherited problems in dogs are found in the eye, which is why it is so important to have your Heeler’s eyes examined regularly by an eye-specialist. Before you buy a puppy, make sure that the parents have been eye-tested recently. If you decide to breed a litter you should always have a recent eye certificate and DNA test certificate for the parents before mating and have the litter screened before they go to their new homes. The Kennel Club, British Veterinary Association and the International Sheepdog Society have a panel of specially trained and equipped vets to perform these examinations. More information on the BVA testing scheme can be found in our links at the bottom of this article. 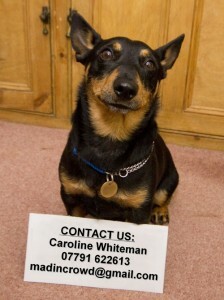 Four inherited eye conditions have been identified in the Lancashire Heeler. 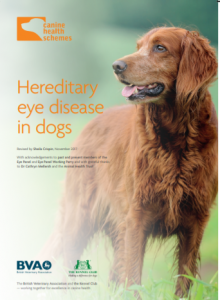 Two are on Schedule A – Primary Lens Luxation and Collie Eye Anomaly, both certified by the BVA as inherited and two are on Schedule B – Hereditary Cataract (early developing) and Persistent Pupillary Membrane, both of which are under investigation. This is a well-documented, painful and blinding inherited condition that affects many breeds, including the Lancashire Heeler. The fibres that hold the lens in place break down as the dog matures and the lens falls out of the correct position. If it falls into the back of the eye, glaucoma and loss of vision can result. The age of onset varies considerably which is why we recommend regular eye-testing so that the condition may be picked up at an early stage, giving the widest options of treatment. The condition is usually found in one eye at first but the other will luxate eventually. There is now a DNA test available from the Animal Health Trust which can identify whether a dog is CLEAR (has two normal copies of the gene) CARRIER (has one normal copy and one faulty copy) or AFFECTED (has two copies of the faulty gene) which will enable breeders to make informed decisions when planning litters to minimise the risk of producing affected dogs. The test only became available on October 19th 2009 and there will be dogs already born who will go on to develop PLL. Each case is very individual, depending on how it happened and what age the dog is etc. so expert advice must be sought. Drops which reduce the pressure in the eye may be prescribed, and can be very effective, but in some cases they have not proved beneficial. Removal of the lens may be undertaken but the operation is expensive and there is no guarantee of success. The final solution may be to remove the eye altogether. CEA is a condition that a puppy is born with. There are several aspects to CEA and it is the subject of on-going research. CEA is an ‘umbrella’ term which covers several conditions, all within the spectrum of CEA. They include CH (choroidal hypoplasia) coloboma, retinal detachments and intraocular detachments. CEA/CH causes abnormal development of the choroid, an important layer of tissues under the retina. It can be diagnosed when a litter is screened and the severity varies considerably. A mildly affected parent can produce severely affected offspring. This manifests itself as a ‘cobweb’ over the eye and is the remnant of the blood vessels that fed the eyes in the womb. They usually disappear by the time the pup is 6-10 weeks old but sometimes small pieces remain, called ‘tags’. They cause the dog no distress but advice should be sought before breeding. This condition has been known in Lancashire Heelers for a long time. A cataract forms at an early age, usually before the age of five, unlike the ‘senile’ or ‘old age’ cataract which develops much later. In the 1980s several dogs were withdrawn from stud when it was found they had produced the condition. This helped to limit the number of cases and we do not hear of many these days. However, it is a condition which needs to be monitored and regular eye-testing will help with this.